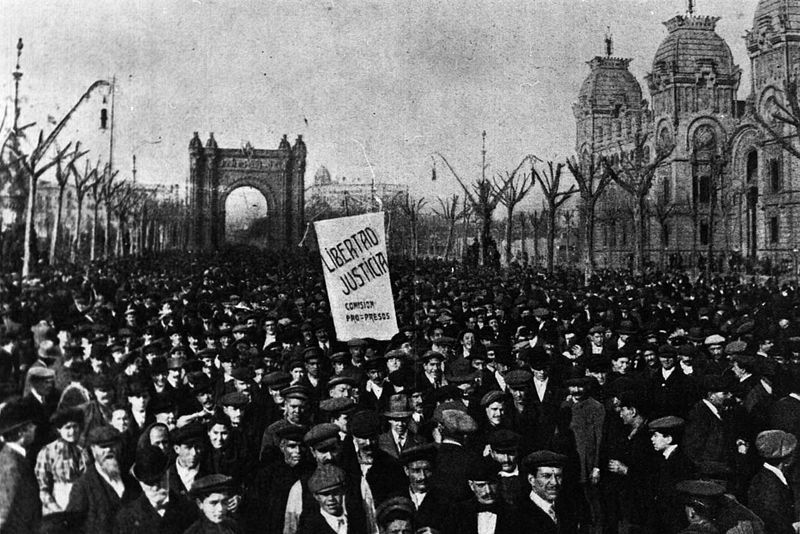 The collapse of the Catalan unions after the general strike of 1902 shifted the center of conflict [between workers and employers] from the economic to the political arena. In the next few years, the workers of Barcelona were to shift their allegiances from the unions to Lerroux's Radical Party. The Radical Party was not merely a political organization; it was also a man, Alejandro Lerroux y Garcia, and an institutionalized circus for plebeians. On the surface, Lerroux was a Radical Republican in the tradition of Ruiz Zorrilla: bitterly anticlerical and an opponent of Catalan autonomy. Lerroux's tactics, like Ruiz's, centered around weaning the army and the disinherited from the monarchy to the vision of a Spanish republic. In his younger days, Lerroux may have sincerely adhered to this program. The son of an army veterinary surgeon, he became a deft journalist who could mesmerize any plebeian audience or readership. After moving from Madrid to Barcelona in 1901, Lerroux openly wooed the army officers while at the same time, in the exaltado tradition of the old Republican insurrectionaries, shopped around Europe looking for arms. Had he found them, however, he probably would never have used them. His main goal was not insurrection but the revival of the dying Republican movement with transfusions of working-class support. This he achieved with dramatic public rallies, violently demagogic oratory, and a network of more than fifty public centers in Barcelona alone. It was Lerroux who introduced into Spain the Casa del Pueblo (People's House), an institution of the Belgian Socialists that combined meeting halls, classrooms, a library, and a tavern in a single building. Later the Spanish Socialists were to establish People's Houses of their own as means of expanding their movement. In addition to the People's Houses, Lerroux and the Radicals provided the Barcelona poor with food cooperatives, mutual benefits, day and evening classes, and inexpensive theatrical productions. Part of the money for initiating this costly establishment came from secret government funds that the Liberal premier, Moret, fed to the Radicals in hopes of counteracting the Catalan autonomists. The masses flocked to the Radicals in droves. More than two-thirds of the party were made up of workers, including tough working-class women who formed their own Radical organizations -- the Damas Radicales and Damas Rojas. The more volatile youth of Barcelona were incorporated into the Juventud Republicana Radical -- the Jovenes Barbaros (Young Barbarians), as they were called -- whose task it was to protect Radical rallies and break up those of opponent organizations. This apparatus spread through Barcelona into the workers' suburbs, collecting thousands into a far-reaching political network. There was nothing to equal this network among Catalan autonomists or the unions. By March 1907, the autonomists had been compelled to join forces against the Law of Jurisdictions, which gave the military authorities the power to try by courts martial all civilian acts inimical to the army. The new electoral bloc, named Solidaridad Catalana, included moderate Republicans, the business-oriented Lliga, and Carlists. Despite its popularity at the polls, Solidaridad Catalana held no attraction for the workers and Murcianos, who no longer took elections very seriously in any case. The unions were still in debris. Many sindicatos (as they were now called) had simply disbanded or were shadow organizations, although their leaders retained contact with each other in the years following the general strike. It was not until 1907 that the Barcelona labor movement recovered sufficiently to hold a local congress. In June a commission composed of metallurgical workers, typesetters, bakers, painters, and store clerks gathered in the store clerks' union headquarters to lay plans for a municipal federation. The federation, called [URL = http://libcom.org/history/one-hundred-years-workers-solidarity-history-“solidaridad-obrera”]Solidaridad Obrera (Worker Solidarity)[/URL], was founded on August 3 and two months later began publishing a newspaper of the same name. Although the new organization grew slowly, it managed to take hold among workers outside the city. A year later, in September 1908, it was expanded into a regional federation embracing 112 labor syndicates throughout Catalonia with a membership of twenty-five thousand workers. The Radical leaders were disconcerted by the emergence of this new rival for working-class support. After an exchange of suspicious cordialities, they began to move against it with the intention of either dominating or destroying it. Initially, the Radicals had very little to fear. Solidaridad Obrera was a "pure syndicalist" union, organized entirely around immediate demands and collective bargaining. The union declared that it was not under the "tutelage of any political party or . . . either of the two branches of socialism" (Marxism or Anarchism). It enjoyed the favor of the governor, Angel Ossorio y Gallardo, who liked its Socialist members and lamented the weakness of their party in Catalonia. Inevitably, however, the labor federation became a battleground between the Socialists and Anarchists. The Socialists, led by union officials like Antonio Badia Matemola, Arturo Gas, and the Catalan intellectual Antonio Fabra Rivas, were intent on bringing Solidaridad Obrera into the UGT1. They strongly approved of the union's opportunism; indeed, as Arturo Gas was to emphasize, "Workers conscious of their position emerge from strong syndicates, and from such workers emerge good Socialists." Like the Radicals, the Socialists regarded Solidaridad Obrera as a rival to their own organization and were intent on absorbing it or crushing it. That they were in the new union at all was due to the Catalan Socialist Federation's lack of influence in Barcelona. The Anarchists in Solidaridad Obrera were Anarchosyndicalists who believed in operating within large labor movements -- workers like Jose Rodrguez Romero, Tomas Herreros, and the publicist Leopoldo Bonofulla. Encouraged by Ferrer, they opened a concerted attack on the Socialists and tried to guide the labor federation toward revolutionary goals. Their efforts, fostered by the drift of the early French CGT toward revolutionary syndicalism, were to be marked by increasing success. The periodical Solidaridad Obrera soon fell under Anarchosyndicalist control, and on June 13, 1909, a congress of the labor federation voted overwhelmingly to accept the general strike tactic "depending upon circumstances." The Anarchosyndicalists were viewed with disdain by the Barcelona Anarchist Communists associated with the periodical Tierra y Libertad and the terrorist-oriented Grupo 4 de Mayo (May 4th Group). This handful of purists was all that remained of the much larger Anarchist Communist movement formed in the 1890s. Their ranks had been terribly depleted by arrests and persecutions. Owing to a lack of funds, they were compelled to give up their headquarters and meet in the offices of the newspaper. The editors, Juan Baron and Francisco Cardenal, regarded the Anarchosyndicalists as deserters to reformism and held faithfully to the doctrines that had formed the basis of the old Anarchist Organization of the Spanish Region. Although there were no visibly organized libertarian federations at this time, Anarchists were numerically significant in the Catalan labor movement. A large number of Anarchosyndicalists were united informally by their common objectives in Solidaridad Obrera. Lerroux's own party contained many ex-Anarchists whose commitment to Republican politics was superficial. These "anarchistic" types (if such they can be called) were to contribute materially to the destruction of the Radical Party merely by doing what it had preached. Yet in the end it was not numerical strength that was to establish Anarchist influence in the Barcelona labor movement, but the sharpening struggle that developed between the Catalan proletariat and the employers. By the spring of 1909, the class conflict between the Barcelona workers and the textile manufacturers began to look like an uncanny replay of the events that had led to the general strike of 1902. On May 15, the Rusinol factory in the Ter valley was closed down, and 800 workers were discharged. The lockout was the opening blow in another campaign to lower wages throughout the textile industry. At a two-day assembly of Solidaridad Obrera in July, speakers exhorted the delegates to throw the full weight of the labor federation behind the textile workers and to plan for a general strike. There seemed to be broad agreement among the delegates on this proposal. Although most of the workers outside the textile industry were apathetic, the idea of a general strike had been accepted by the union not merely in the abstract but concretely -- as a strategy that would be translated into action if there were sufficient provocation from the manufacturers or the government. It was against this background of mounting crisis in Barcelona that the Maura ministry, on July 11, announced a call-up of military reserves for active duty in Morocco. The call-up was not entirely surprising. Skirmishes and sporadic encounters between Riff tribesmen and Spanish troops had been going on for weeks. The odor of an impending war was already in the air. It was no secret that the Riff forays were menacing the supply routes to valuable iron mines owned by major Spanish capitalists. To the Spanish workers, the prospect of shedding their blood to protect the colonial holdings of a few wealthy magnates was not particularly alluring. Maura's call-up had produced heartrending scenes in Barcelona, the main port of embarkation for Morocco. Many reservists were desperately poor Catalan workers whose families were in no position to lose their breadwinners even for a few days, much less allow their lives to be endangered in imperialist adventures. Antiwar feeling ran high throughout the country. On July 18, Pablo Iglesias, a man who for decades had made prudence the keystone of Socialist policy, warned an antiwar rally in Madrid that "if it is necessary, workers will go out on a general strike with all the consequences." But when would it be necessary? On the very day of Iglesias's speech, the Riffs attacked the Spanish supply lines for the first time, turning what had been sporadic engagements into a full-scale war. Demonstrations at the Catalan port spread to train stations in other cities where reservists were being called up. This crisis was raised to acute dimensions in Barcelona when on July 21 El Poble Catala published a petition by the Catalan Socialists to their Madrid headquarters, calling for a general strike throughout Spain. Nearly a week had passed since Iglesias's warning without any follow-up action being taken by the UGT. In the meantime, the turmoil in Spain continued to mount. As El Poble Catala editorialized: "The valves have been closed and the steam is accumulating. Who knows if it will explode?" The stalemate was suddenly broken on the night of July 24, when two Barcelona Anarchists, Jose Rodriguez Romero and Miguel Villalobos Morena, decided to constitute themselves as the nucleus of a Central Committee for a Strike. Rodriguez Romero was an Anarchosyndicalist official in Solidaridad Obrera, and Villalobos Morena had been a schoolteacher in a mining village who was forced to leave his post for publicizing Anarchist ideas. During the events discussed above, Villalobos was on the staff of Ferrer's Modern School and later represented the "syndicalists" on the Central Committee for a Strike. Both men, of course, were Anarchists in their dedication to a libertarian society and libertarian methods of struggle. Collecting whatever support they could find among the militant officials of Solidaridad Obrera, they fanned out through the city to gain commitments from other leaders. Faced with a fait accompli, the Catalan Socialists, who had been waiting for word from Madrid, now had no choice but to join the Committee. To have remained outside would have cost them the opportunity of playing a leading role in the strike action. Among the Radicals there was to be a division in attitude between the top leaders and rank-and-file militants. Lerroux had gone abroad in February 1909 to escape trial on an old charge of writing a seditious article. He prudently remained away until October 1909, long after the upheaval had subsided. The leadership of the party fell to Emiliano Iglesias Ambrosio, a shrewd lawyer and politician whose sole policy was to prevent a revolution without damaging the Radicals' reputation for militancy. In trying to curry favor with both the army officers and workers -- two essentially antagonistic camps -- the Radical politicians succeeded in satisfying neither group. Although a year later the Radicals were to score a large electoral victory, the Catalan workers were to abandon the party and turn away from politics. The army, for its part, was to develop its own organizations, the Juntas de Defensa (Committees of Defense), after which it drifted almost completely toward reaction. The Central Committee for a Strike had been formed on a Saturday night. By Monday the strike was underway. In the morning hours, strike delegations appeared at the factory gates to call out the workers. To protect their property, the employers closed down the factories, once again swelling the ranks of the strikers as they had in 1902. From the outset the Anarchists associated with Tierra y Libertad tried to turn the strike into an insurrection, but their most able activists were quickly arrested by the authorities for inciting crowds to attack the police stations. They were removed from the scene almost as soon as the strike began. The Socialists on the other hand, fearful of "Anarchist turmoil," tried to confine the strike to an antiwar protest and regarded any attempt at a revolt as adventuristic. The events were to astonish everyone. During the week of July 26 to August 1, Barcelona would present the spectacle of a full-scale insurrection, a largely spontaneous uprising that received little guidance from the union or Radical leaders. As Anselmo Lorenzo wrote to Tarrida del Marmol in London: "What is happening here is amazing. A social revolution has broken out in Barcelona and it has been started by the people. No one instigated it. No one has led it. Neither the Liberals nor Catalan Nationalists, nor Republicans, nor Socialists, nor Anarchists." Had he known all the details, Lorenzo might have added that the civil government in the city had collapsed. On the first day of the strike, the governor of Catalonia, Don Angel Ossorio y Gallardo, became locked in a feud with his superior, the minister of interior Don Juan de la Cierva and his military counterpart, Santiago, the captain general of Catalonia. He resigned in a huff from his post and withdrew to sulk in his summer mansion on the Tibidabo. Santiago, mistrustful of the local garrison, confined most of his troops to their barracks, abandoning the streets to the revolutionaries. Whatever leadership emerged came from the militants in the Radical Party and Solidaridad Obrera. "By default the leadership of the uprising passed to the militants . . ." observes Joan Connelly Ullman in her detailed study of the insurrection. "They were anarchist by conviction, although nominally members of the Radical party or Solidaridad Obrera." Their efforts were never coordinated by the Committee, which stonily refused to issue any directives and wasted much of its time trying to coax the Radical jefe, Iglesias, into joining it. Iglesias, now concerned only with his personal safety, refused. Thus from the outset the insurrection followed its own course. The crowds roaming the main street were careful to distinguish between police and soldiers. The latter were wooed with cheers and antiwar appeals whenever they appeared; the police stations, on the other hand, were attacked with ferocity. This canny approach proved to be highly successful. The police made themselves scarce while at the Paseo de Colon, a group of dragoons refused to obey an order to open fire on the crowd. Railroad lines leading into the city were blown up, temporarily isolating Barcelona from garrisons outside the city. Barricades were thrown up in the working-class districts and arms distributed. Women played a very important role in the revolt, often joining the men in the actual fighting. The struggle aroused not only the workers and Murcianos but also elements of Barcelona's declasses, especially prostitutes. Nor was it for want of leadership that the insurrection was suppressed, all myths about the limits of popular spontaneity notwithstanding. The crucial problem was the lack of support outside Catalonia. The breakdown in communications between Barcelona and the rest of Spain worked to the full advantage of the government, which misrepresented the uprising as an exclusively autonomist movement. The non-Catalan working class and peasantry, lulled by a false picture of the events, made no effort to aid the revolutionaries. Except for workers in a number of industrial towns nearby, the Barcelona proletariat fought alone. And it fought with great courage and initiative. By Wednesday, July 28, large troop detachments reached the city and were deployed against the insurrectionaries. Intense fighting continued well into the next day. In the Clot and Pueblo Nuevo districts, the resistance of the workers was so furious that artillery was needed to clear the barricades. Even after the barricades were demolished, dogged fighting was carried on in buildings and from rooftops. Elsewhere, the fighting was sporadic. The morale of the workers had been shaken by the news that their revolt was an isolated one. For instance, the UGT, the only national labor federation in Spain at the time, did not issue an appeal for a general strike until Tuesday night, July 27, two days after Barcelona had risen. Moreover, the appeal was not distributed until Wednesday, and it scheduled the strike for the following Monday, August 2 -- two days after the Barcelona insurrection had been suppressed. There was little clarity about the aims of the insurrection. The Socialists, as we have noted, saw the uprising as an antiwar protest, the Anarchists as a social revolution, and the Republicans as a blow against the monarchy. By Tuesday the "Tragic Week" had developed a sharp anticlerical edge that was to characterize it almost to the very end. Before the week was over, an estimated eighty churches, monasteries, and Catholic welfare institutions were destroyed. It is fairly evident now that this widespread damage to clerical institutions was instigated by the Radical politicians who were eager to divert the workers from revolutionary paths into well-grooved anticlerical channels. Very little was required to launch this effort: the church was thoroughly detested by the workers and middle-class radicals in Barcelona. The monasteries and nunneries were regarded as prisons in which recalcitrant novices were tortured into obedience or (as popular rumor had it) simply killed. The aura of torture and terror which suffused popular attitudes toward the church led to a number of macabre incidents. Having "liberated" the monks and nuns, the well-meaning attackers proceeded to exhume bodies in the monastic vaults and cemeteries, looking for evidence of ill-treatment before death. When some cadavers were found with bound limbs (a practice of the Hieronymite nuns), they were carried to the City Hall as evidence of torture. In one case, a number of bodies were deposited on the doorsteps of several prominent Catholic laymen. While this was going on, a young, simple-minded coalman, Ramon Clemente Garcia did an obscene dance with one of the corpses as an "amusement." He was arrested by the Civil Guard and later shot, ostensibly for "building a barricade." The fighting in Barcelona came to an end on Saturday, July 31, when Horta, the last outpost of rebel resistance, was overcome. The rebels there had fought until further combat was impossible. They had insisted they were going to "carry out the revolution" despite the overwhelming odds against them. When the "Tragic Week" was over the police had lost a total of only eight dead and 142 wounded; the fatalities among the civilian population were officially reported as 104, but this figure is almost certainly an understatement and should be weighed against Buenacasa's claim of 600 dead (Buenacasa was one of the participants in the uprising and his figure, although almost six times the official one, should not be totally discounted). The number of wounded will never be known. Although the reactionary press bellowed about attacks on the clergy, only two monks had been deliberately killed. Clearly, in the assaults launched upon religious institutions, the objective was not to take life but, as Joan Connelly Ullman has noted, "to destroy the property -- the wealth -- of the clergy." No sooner was the revolt over when courts martial were established to punish the revolutionaries. According to official reports, 1,725 individuals were indicted by military courts in the ten-month period following August 1. Two hundred and fourteen had escaped the reach of the army and were never captured. On closer examination, the courts were obliged to dismiss the charges against 469 and acquit another 584. In the end, this left about 450 people to be tried and sentenced, mostly to varying terms of imprisonment. Seventeen were sentenced to death, but only five were executed in Montjuich prison. The remainder had their sentences commuted to life imprisonment. In four of the five capital cases, the trials were almost completely without juridical foundation: the victims were executed not because they had committed the most serious offenses with which they were charged, but because the authorities wanted to make examples of them. The military had apparently decided to shoot at least one individual for each of the major acts committed in the insurrections. Thus its selection of victims was largely arbitrary. The fifth and last person to be executed was Francisco Ferrer. Ferrer had been abroad between March and June of 1909. He had returned to Barcelona in order to be at the sick bed of his sister-in-law and dying niece. During the uprising he had spent most of the time at his farm, some fifteen miles outside of Barcelona, and his movements had been watched closely by the police. Ferrer had very little influence on rank-and-file revolutionaries and Radicals in the city. Although he had befriended such outstanding Anarchists as Anselmo Lorenzo and Federico Urales, the ordinary Anarchists and syndicalists had been scandalized by his financial activities and the publicity given to his relations with women. The Radicals were interested mainly in Ferrer's financial contributions to their cause. The Socialists, for their part, detested him. Nearly everyone regarded his political support as a liability. They were ready to take his money (Solidaridad Obrera's headquarters, for example had been rented with a loan from Ferrer) but few were willing to listen to his advice. Yet this man was a sincere revolutionary. In contrast to Radical leaders like Iglesias, he devoutly hoped that the general strike would turn into a revolution. The government and clerics hated him and were intent on destroying him. When he was captured on August 31, after hiding for five weeks in caves on his farm, the prelates of Barcelona sent a letter to Maura openly demanding vigorous action against Ferrer and the Escuela Moderna. Maura publicly replied that the government "will act in the spirit of your letter and follow the line of conduct you indicate." Accordingly, Francisco Ferrer was tried for his life by a military court that had arrived at its verdict well in advance. The proceedings lasted only one day. The prosecution was allowed liberties that scandalized world opinion: anonymous affidavits and hearsay accounts were admitted into evidence against the defendant; prisoners who were faced with serious punishment for their own offenses were evidently given the opportunity to trade heavy sentences for testimony against Ferrer. Evidence in Ferrer's favor was suppressed, and cross-examination by the defense circumscribed to a shocking extent, even by Spanish standards of the day. One witness claimed that Ferrer had participated in the burning of convents in a community where none in fact had been burned at all. On the morning of October 13, 1909, Ferrer was executed by a firing squad in Montjuich prison. He is said to have died serenely and with great courage. As the men were aiming their weapons at him, he cried out: "Look well, my children! I am innocent. Long live the Escuela Moderna!" The judicial murder of Ferrer was an act not only of gross injustice but political stupidity. The case led to demonstrations throughout Europe and contributed directly to the downfall of Maura's ministry. No less important were the long-run effects of the repression that followed the uprising. The government used the revolt as an excuse to suppress the Catalan unions, suspend the publication of opposition newspapers, and close virtually all private lay schools in the restive province. Although Spain had been placed under martial law directly after the outbreak of the insurrection, full civil rule was not restored in Catalonia until November 7, almost six weeks after its restoration in the rest of the country. As we shall see, these measures further radicalized the Catalan proletariat and increased the influence of the Anarchosyndicalists in the labor movement. The "Tragic Week" rallied the manufacturers around Madrid and marked the first major step toward ending independent bourgeois politics in Catalonia. Indeed, almost everyone in Spain became mistrustful of electoral methods and drifted toward political subterfuge or the use of direct action. The industrial bourgeoisie returned to its old practice of making behind-the-scene deals. The Conservatives and Liberals, although falling out increasingly between themselves, became uneasy about calling elections. All the members of the privileged classes began to live under a single cloud: the danger of a mass uprising by the urban proletariat. The inner paralysis of these classes increasingly tended to paralyze the entire constitutional system, restricting political life to maneuvers within the government. Ironically, the Barcelona uprising might have breathed some life into the dying system of Turnismo -- just as the Federalist revolt of 1873 had evoked it -- had it not been for the political machinations of the young king Alfonso XIII. His overt intervention in parliamentary affairs was to prove a fatal blow to electoral politics, leading directly to the Primo de Rivera dictatorship of the 1920s. The first monarch of the Restoration, Alfonso XII, had accommodated himself to the constitutional regime of the 1870s and 1880s. The landowning oligarchy ruled, and the monarchy for the most part obeyed. The death of the king in November 1885 would have been greatly lamented had the oligarchs been able to foresee the role that his successor would play. They were to be spared this vision for two decades; the second Restoration monarch, Alfonso XIII, was a posthumous child, born six months after his father's death. His mother, Dona Maria Cristina, did nothing to threaten Canovas's scheme for stability, and these decades were the most stable in modern Spanish history. Industrial development proceeded at a fairly brisk pace. The army's role in politics was curbed, the Carlists were slowly assimilated into the established order, and the labor movement was periodically crushed when its growth became worrisome. But while Canovas was building up this new political establishment, the young king was being taken over by the army. Educated in the fashion of a military prince, he lived amid parades, swords, uniforms, and officers who schooled him in the prerogatives of command. On ascending the throne in 1902, this half boy, half general began to exhibit an annoying interest in his kingly privileges. The Restoration Constitution of 1876 had given the monarch the right to appoint and dismiss the premiers of Spain, and as 1909 drew to a close, Alfonso decided to exercise his royal authority in a more direct fashion. When Maura, confronted by Liberal obstruction in the Cortes, tried to bolster his position by asking the throne for a renewal of confidence, Alfonso astonished the Conservative premier by accepting his formal offer of resignation and replacing him with the Liberal, Moret. With this treacherous act, Alfonso virtually terminated the Turnismo, a system that had stabilized the Spanish government for a quarter of a century. If Maura entertained any hope of using the repression to strengthen his own grip on the government, he was soon to be disenchanted. Although he had a majority in the Cortes, he was dropped because his handling of the "Tragic Week" and the Ferrer case had deepened the split within the country and turned world opinion against Spain. How long Maura could have survived had the king supported him is difficult to say. Obviously the whole structure created by Canovas was already disintegrating, and Alfonso's intervention in the affairs of the oligarchy was doubtless an effect, not merely a contributory cause, of its decline. In any case, with the passing of the Maura ministry, the Canovite system of a disciplined alternation of parties began to give way to irresponsible infighting between unprincipled political factions, leading inevitably to the piecemeal crumbling of the constitutional structure.